Plenty of multicast networks are now broadcasting over the digital subchannels of broadcast stations, but good luck finding original programming on them. Most of these so-called diginets have taken the relatively inexpensive route of mining libraries of classic TV shows and movies, often from their parent companies. Examples include NBCU’s Cozi TV, Sony’s GETtv, Tribune’s Antenna TV, Tribune/MGM’s This TV, Fox/Weigel’s Movies!, Weigel’s Heroes & Icons and Fremantle’s Buzzr. Another channel, Sinclair’s Stadium TV, programs an all-original lineup of sports talk, sports news, and college games. Sinclair’s TBD, meanwhile, plucks content off the web that is certainly “original” to traditional TV viewers. My own favorite original diginet content had been the historic newsmagazine series, “Through the Decades,” on CBS/Weigel’s Decades, but since the CBS-owned stations in September strangely dropped their own diginet in favor of yet another rerun network, Weigel’s Start TV, I've been unable to watch Decades. 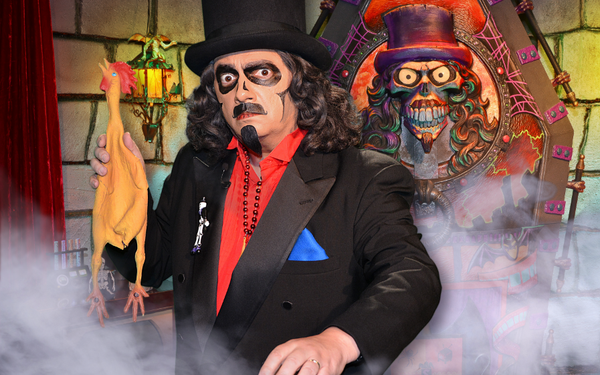 So, my favorite original diginet series is now “Svengoolie,” airing Saturdays at 8 p.m. ET on Weigel’s Me TV. Last week’s presentation was “Gargoyles.” This 1972 made-for-TV CBS movie must have exhausted the bulk of its budget on its two leads: big-screen stars Cornel Wilde, acting fatherly, and Jennifer Salt, screaming a lot as Wilde’s daughter while romping around in skimpy outfits. How little money remained for the actual production is obvious from the film’s extremely low-budget look. But the story itself isn’t bad, and future special effects Oscar winner Stan Winston (“Aliens, “Terminator 2,” “Jurassic Park”) would even go on to win an Emmy for makeup. No such honors would come for the film’s costuming, however. Consider that the movie’s numerous gargoyles walk around in silly rubber suits. But nearly half a century later, those rubber-suited gargoyles nicely complement the rubber chickens that get tossed at Svengoolie throughout every episode of his MeTV show. Such lead-outs -- and lead-ins -- to every movie segment are a key feature of “Svengoolie,” along with awful jokes (“What’s the definition of gargoyle? What you use to oil your garg when it’s squeaking”), product promotions (“Look goodie in a hoodie”) and special guests (a “Jeopardy” contestant who answered, “Who is Svengoolie,” instead of, “Who is Svengali,” to a question about the fictional hypnotist of the latter name). Other segments include a neat pre-movie synopsis (warning: spoilers!) and well-done backgrounders on cast members, even some in minor roles (such as, in “Gargoyles,” a very young Scott Glenn). “Svengoolie” also features songs set to clips of each movie, in this case making fun of the fact that even the main winged gargoyle doesn’t fly until the very end of the film (“Why don’t they fly?” Svengoolie sings. “Because the budget grounded them, that’s why!”). “Television critics used to always scoff at movies like this,” Svengoolie later complains. “You’d have thought they would have embraced such a small-budgeted, but ambitious, production. Never say “never,” king of the gargoyles! In 2018, TV critics can understand how ambition can elevate small-budget productions. So, we can not only embrace “Gargoyles” but the even lower-budgeted “Svengoolie” as well.